Was recognized as the 8th Thepo Tulku and trained in the Ganden Shartse Monestary. From 1975 to 1980, he worked at theLibrary of Tibetan Works and Archives in Dharamsala, India, and served as a special cultural advisor for the Smithsonian Institution Tibetan Library. In 1983, he moved to Northern California, and has worked as an activist for the Tibetan cause in various capacities: as a founding board member of the Bay Area Friends of Tibet in 1983; a board member and co-founder of the Tibetan Association of Southern California in 1990; President of the Tibetan Association of Northern California in 1994; and as Coordinator for the Tibetan Resettlement Project beginning in 1993. 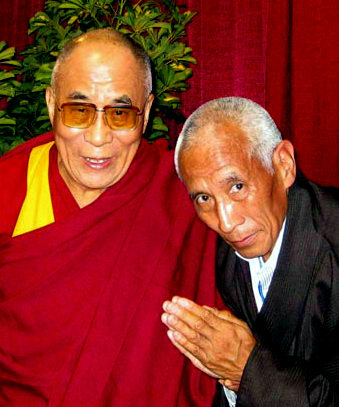 He currently lives in Santa Barbara and is co-founder of the Santa Barbara Tibet Summit. Thepo has an incredible life story, born in Tibet and escaped into the Himalayas for five years as a child carried on the Monks' shoulders and backs with the group that followed the Dalai Lama to India. Thepo lived and studied in Ganden Shartse Monestary and became a Monk, Lama, Rinpoche and served the Dalai Lama and is his lifelong follower and friend. He is a great supporter of The Sacred Space. He has been instrumental in arranging events with Monks & Lamas creating a Sand Mandala and healings and Blessings at The Sacred Space. In the times we have spent with Thepo he has told us about his life's journey. It is a very special and humble story that has left an indelible impression in my and Rose's minds. He and the Tibetan community are intimately involved in the mission of helping Nepal's people.